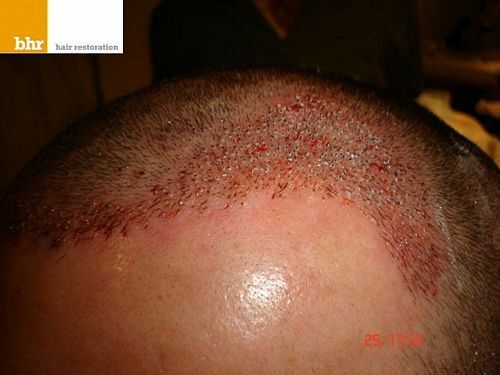 Here are some photos of 1,465 FUE done with a .75mm punch. Dense results. It’s hard to argue that the .75 punch damages the extracted grafts. I think the .75 helps protect the surrounding FU’s in the donor from peripheral transection. 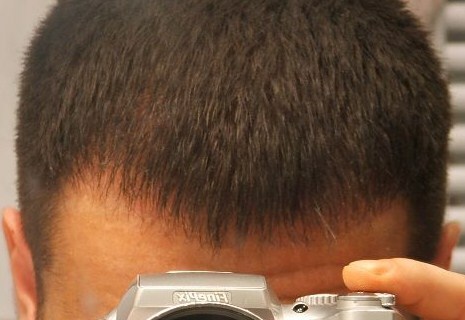 Sorry to hijack your thread like this but the guys hairloss looks really similar to mine. I was wondering why do you need to transplant onto the center part of his hairline when it is already good? The results look fantastic. What are the timline of the pics? The pictures are in order before then 3 months 4 months and then the last ones are at 5 months… the wet look. BTW just to give credit to the poster philB. He is BHR’s representative. » timline of the pics? The pictures show from post op and pre op, from three months to five months, like Thomas says the latter are wet pictures. Thank you Thomas for finding the time and inclination to post one of our FUE patients, spontaneous impulse on your behalf, so all the best to you. 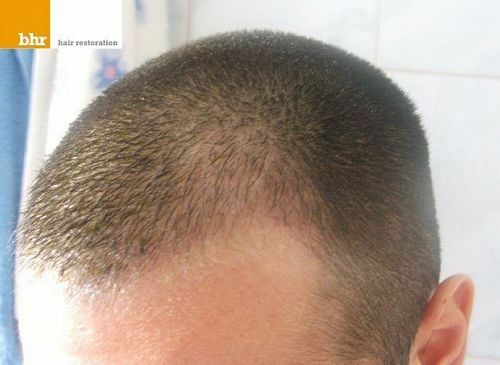 He was a NW3, looking to restore his hair line and temple points. 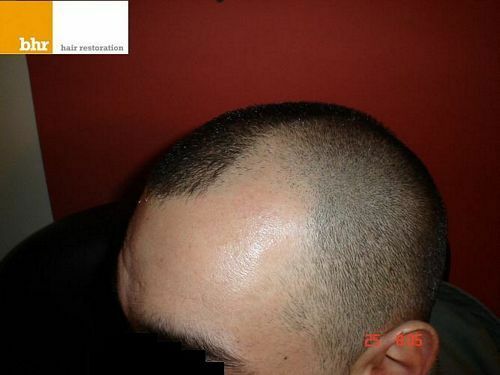 His hair line was designed in accordance to bone structure, age, donor density and potential future hair loss. With these factors taken into consideration it was agreed to design within these limits. 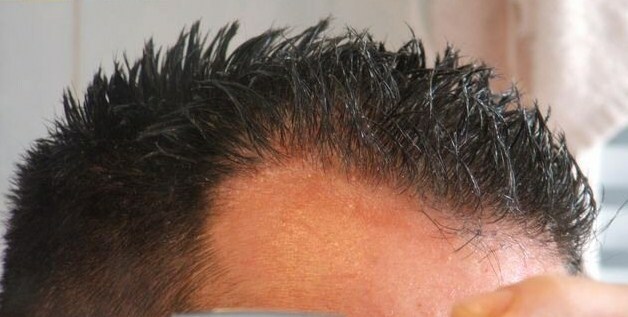 The apex of the hair line was lowered to ensure the correct temple angles would be made and the fact that there was miniatursiation in the front and it needed to be addressed. Hey Phil, I started looking at different clinics post op pictures and found several doctors that have compelling results. There was a few inquiries here concerning FUE and good growth. I aaplaud Dr. Bisangas work. » » similar to mine. » » timline of the pics? » spontaneous impulse on your behalf, so all the best to you. Donor FUEs per cm2 / donor hair available for future procedures? Was the hair wavy etc ? 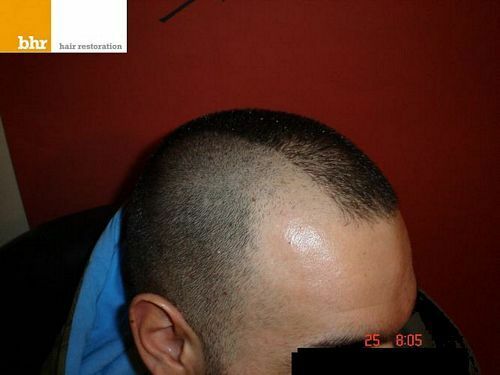 In the hairline area how many grafts were placed per cm2 for the hairline zone? The above information would allow many of us to determine if similar results are achievable, if we know our own hair characteristics. I am 29 and in a similar situation as the patient preop and I am weighing my options for FUE for a similar look. » here concerning FUE and good growth. I aaplaud Dr. Bisangas work. yep, its easy to forget there is a world of surgeons outside those that post here and there would seem to be many that produce damn good results these days. 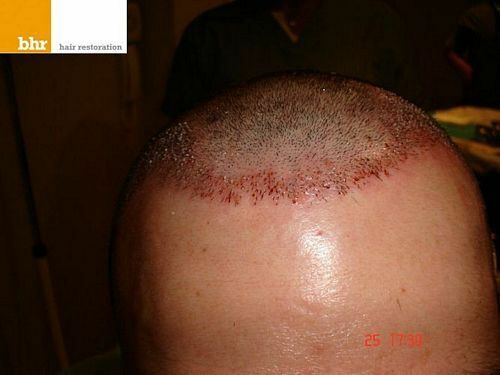 » 1) Donor FUEs per cm2 / donor hair available for future procedures? » 2) Hair Caliber ? » 3) Was the hair wavy etc ? 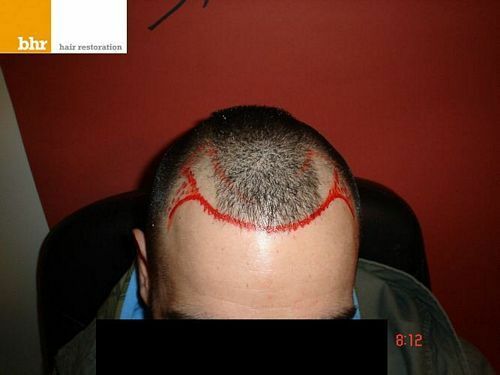 » options for FUE for a similar look. » Thank you in advance. His donor density peaked at 90 and lowered to 80-85 FU cm2; good hair characteristics, relatively good skin to hair colour ratio, not wavy hair. The hair line is always made up of single hair FU, the density is going to be relative to hair calibre and characteristics but generally between 65-80 FUcm2. Behind the density decreases slightly because multiple hair FU make up for less FU being placed. The future, he has good characteristics and donor for FUE whilst maintaining a healthy donor area. Assuming safe donor management to not over harvest then in the region of 3500-4000 more. It is impossible to give a fair idea because only 1465 have been extracted at this stage, so maybe more than this, but to be realistic keep to the numbers above. 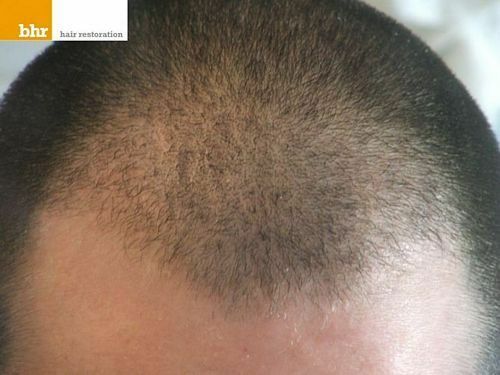 Like I said above it is a solid result especially for relatively few grafts - obviously hair characteristics (which were favourable) come into play with the graft requirement but also that the grafts were placed at the correct angulation, for maximum coverage and naturalness. 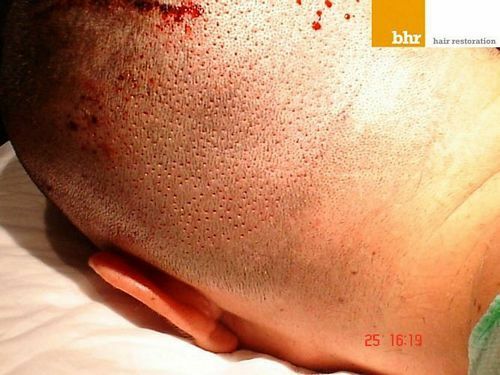 Can you comment on the angulation employed by BHR? 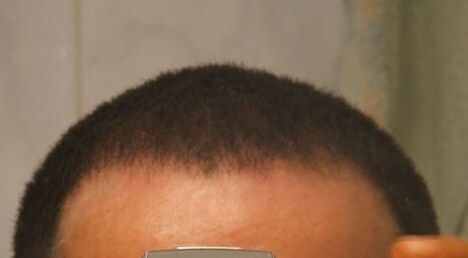 Do you follow the angle of any existing hair that maybe present or do you employ a lower angle. What I mean is, on some of the older transplants (not by your clinic) you see many grafts angled vertically ie 90 deg which 1) is unnatural and 2) actually decreases the coverage of the new hair. A lower angle affords better coverage. If you have no hair in the hairline ie you had to build a hairline from scratch what sort of angle would Dr Bisanga employ? » Thank you very much for the reply. » the correct angulation, for maximum coverage and naturalness. 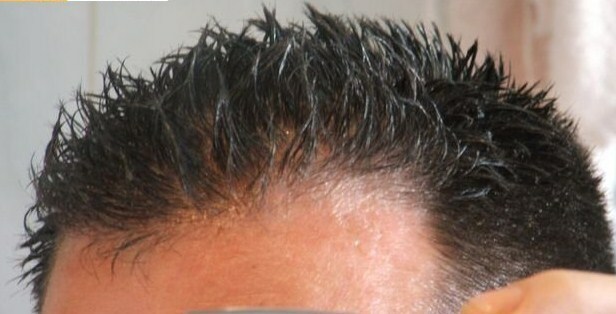 » of any existing hair that maybe present or do you employ a lower angle. » scratch what sort of angle would Dr Bisanga employ? 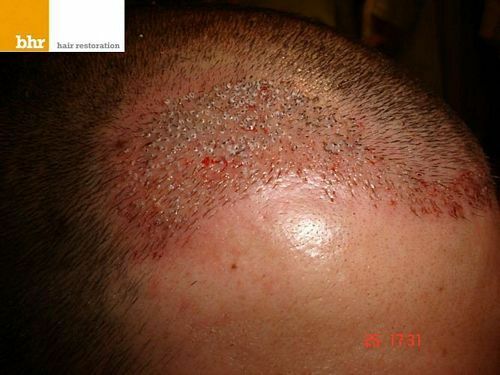 Slit angulation can be more acute to improve coverage specially on bald scalp to provide greater coverage and “shingling effect”. Basically there are rules that have to be adhered to, the natural angles we were born with but there is leeway within the art of design that let’s us bend the rules to make the most out of the hair at our disposal; some will depend on the goals of the patient against the donor limitations. 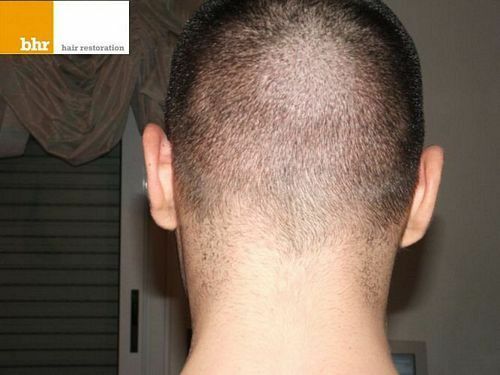 The angulation of incisions varies according to the position on the scalp, for example more acute on the sides and back of the scalp whilst less acute on the top and temple point slits can be very acute lying almost flat to mimic the direction of the existing hair. 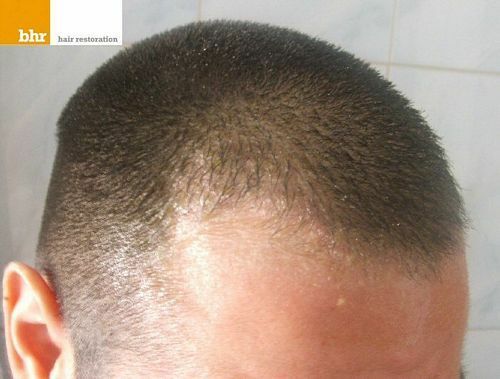 So, it depends on where on the scalp the hairs are placed, it’s not possible to make any type of angulation you want, it is necessary to follow the existing hair if any there or create angulation by keeping to the basic rules. 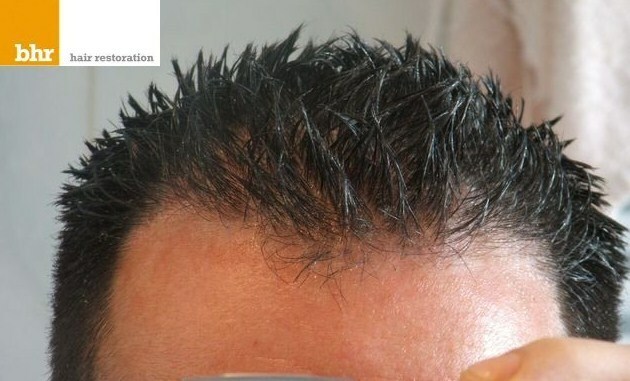 Who says you can’t have great results using FUE, this is fantastic and only 1465 grafts? Do you have video? The pics look amazing but it would be nice to see a video too. Philb will probably take it from here. He is Dr. Bisanga’s representative. I know he has different videos, and I can assure you the clinic has more results than just 4 or 5 results over the past few years. 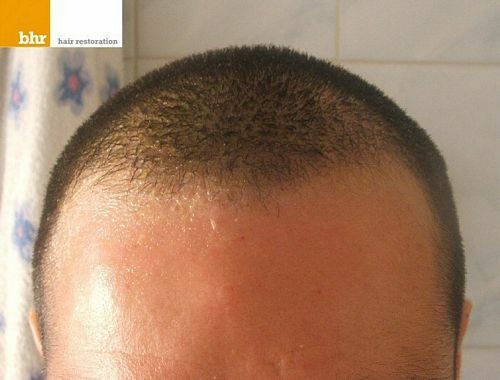 In fact after doing a simple search on a different website for hairloss, did I find many compelling results and it showed definitively that the 0.75mm punch can in fact produce good results. » nice to see a video too. Thank you for the comments; I will arrange a video of the result when I meet the patient in just under a months time then post it. 1000-1500 grafts €4.75, 1501 and above €4.50 for the total amount of grafts placed,not above the threshold. Philb, Is their a reduction in the cost to fly to Europe from the US? I thought I heard or read where Delta and/or a competing airline was offering extremely low air fares compared to the normal airfares off the past. I do know that hotel fares in Belgium are reasonable as you know I have stayed in belgium many many times. I ask this to help folks get a “jist” as to how much travel is to Europe if folks decide to go that route. yes, one of the best fue I ve seen that is under 1500 grfts. 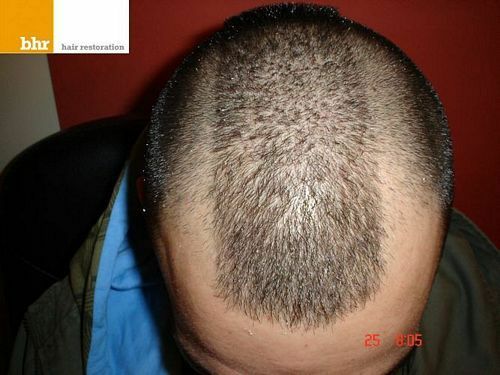 » yes, one of the best fue I ve seen that is under 1500 grfts. 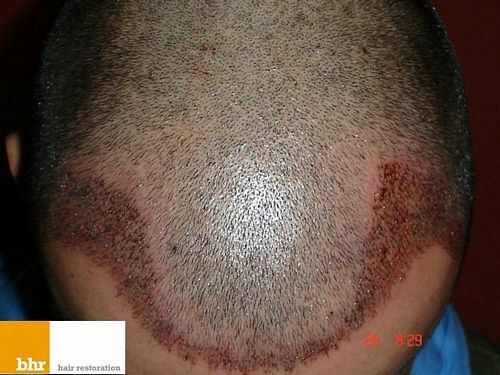 Great result, I like the hairline placement, looks very natural to me. I spoke to Philb the BHR representative yesterday. He said he would gather some more pictures for you guys. I remember Dr. Wolf also did a 1500 grafts FUE that was just as impressive. I don’t know why but it has always been the smaller procedures that impress me most. 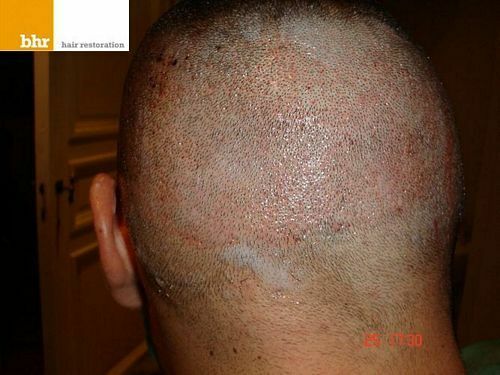 » I remember Dr. Wolf also did a 1500 grafts FUE that was just as impressive.